This report shows each student registered in the time period entered and includes that family the student is linked to. You can sort by Family to see if anyone is not attached to a family. *This report is available to Every Studio. You do not have to offer online registration. Click the word pay on any of the invoice lines. The system will bring you to the family invoices page. If you are brought to a form, this student is not linked to a family. You can also use the family ledger report to see which family a student is linked to. Use a large date range to include anytime the student may have received or paid an invoice. You may filter for the student. It will show which family the student is connected with. !If you have trouble connecting a student to a family link: Make sure the student has a guardian listed on the guardian information tab. 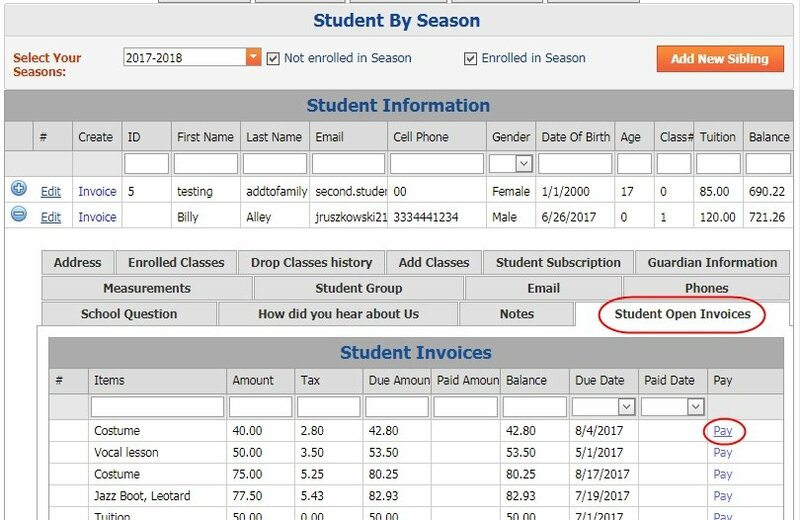 If the Student Address and Guardian are missing, the student did not get created correctly. Please populate both of these tabs. Then go to the Family link page to add the student to the appropriate family.